Newspaper clipping with a marriage announcement and a death notice. The marriage announcement pertains to the marriage by Rev. Dr. McElroy of Mr. E. R. Noble of Muncy, Pennsylvania, and Miss Mary Hepburn Hayes, youngest daughter of Dr. William Hayes of Palisades, Hudson River. 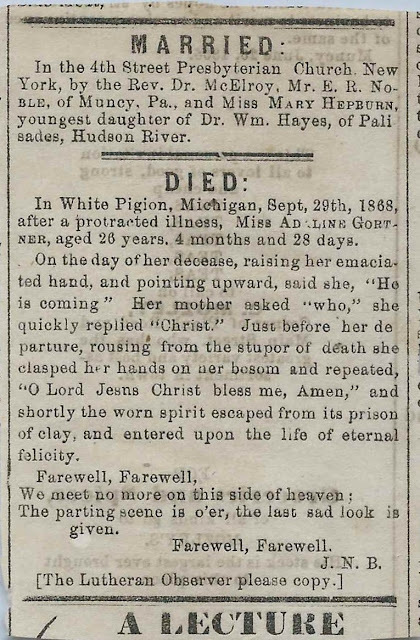 The death notice pertains to the death at age 26 of Miss Adaline Gortner at White Pigeon, Michigan. In the clipping White Pigeon is erroneously spelled White Pigion. From information on his memorial, Ernest Randolph Noble was born December 9, 1841. I believe he was born at Muncy, Pennsylvania, son of Hezekiah Noble and Jane M. (Brown) Noble. Mary Hepburn Hayes was born October 13, 1837 in Pennsylvania, daughter of Dr. William Hayes and Sarah (Hepburn) Hayes. Read a lengthy obituary of Dr. Hayes, who served during the Civil War here. According to the obituary, he moved after the war to Palisades to recover his health and then to Muncy, Pennsylvania, where he and Sarah are buried, along with Mary and Ernest and his second wife. Ernest and Mary married on October 7, 1868. Mary died August 10, 1878 and is buried in the Muncy Cemetery at Muncy, Pennsylvania. I don't believe they had any children, at least any children that survived. A Pennsylvania Marriages record shows that on January 10, 1880, at the Calvary Presbyterian Church at Philadelphia, Pennsylvania, Ernest married Margaret Montgomery Dunning Petrikin. Margaret was born April 13, 1857, daughter of John Montgomery Brindle Petrikin and Frances Hollingsworth (Lloyd) Petrikin. Ernest and Margaret would have several children. A monument in the Muncy Cemetery at Muncy, Pennsylvania shows birth and death dates for Ernest, who died June 22, 1907; Margaret; and three children. Adaline Gortner was born about 1842 in Pennsylvania, the daughter of George Gortner and Mary (Shoemaker) Gortner. Census records show that she was living at Muncy, Pennsylvania, as late as 1860, and was perhaps born there, as well. 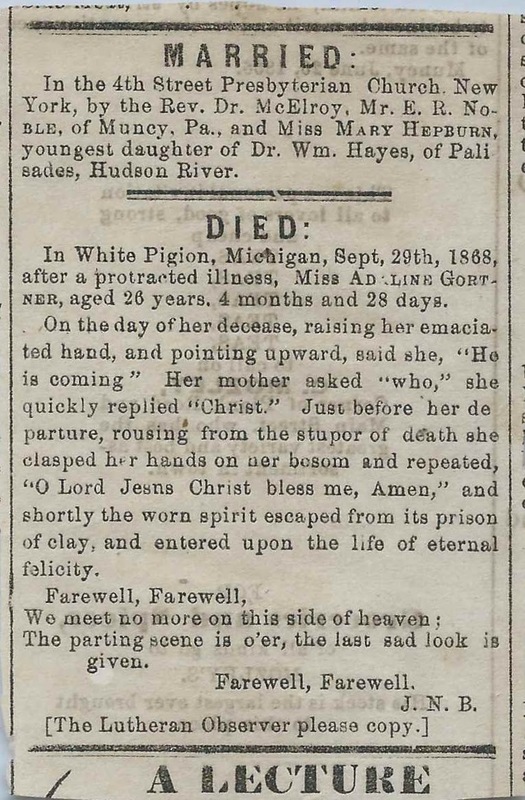 She's buried in the White Pigeon Township Cemetery at White Pigeon, Michigan, with her parents and other relatives. Because both notices have a Muncy, Pennsylvania, connection, the newspaper from which the clipping was removed, was presumably from the Muncy area.